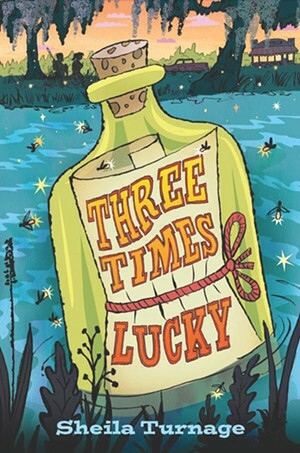 Book Review: Three Times Lucky | The Librarian Likes | Kids VT - small people, big ideas! Landauer's summary: Sixth-grader Mo — short for Moses — is a budding detective who finds herself in the middle of a murder investigation that may be tied to her own slightly mysterious past. The book is full of quirky characters, including Mo's wise but weird stand-in dad, the Colonel, who lost his memory at the same time he found Mo; Mo's best friend, Dale Earnhardt Johnson III, whose family has troubles of its own; Mo's arch enemy, Anna Celeste; and colorful Miss Lana, Mo's stand-in mom and owner of the local café. Together, they try to solve the murder mystery, and their group detective work is complicated by a hurricane, a car crash and a kidnapping. Along the way, Mo tries to answer some big questions, including: Where is her mother? And what is the real meaning of family? Why you will like it: What a fun surprise to find hard-boiled mystery writing, complete with loads of inventive metaphors, in a kids' book! Three Times Lucky is entertaining but never lightweight. This New York Times bestseller is in the running for a 2013-14 Dorothy Canfield Fisher children's book award. Ask your librarian for more DCF winners and nominees. 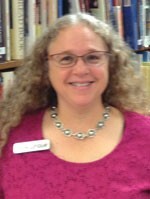 "The Librarian Likes" features a different librarian and book each month. Got an idea for a future "LL"? Email us at ideas@kidsvt.com.